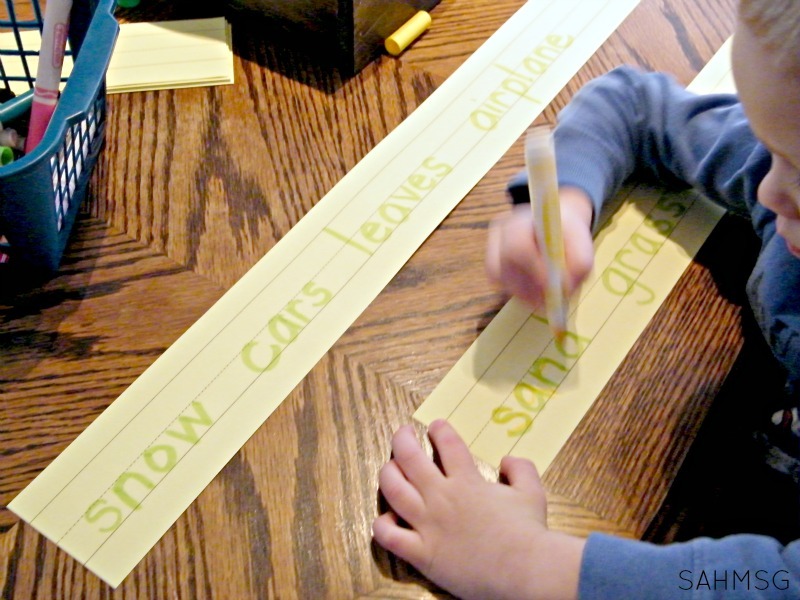 A word wall is an activity that I start when my children are toddlers. It is part of our homeschool preschool activities, and I know that it helps my children learn to read with confidence. Play does matter in the lives of young children, but we can also teach them along the way. 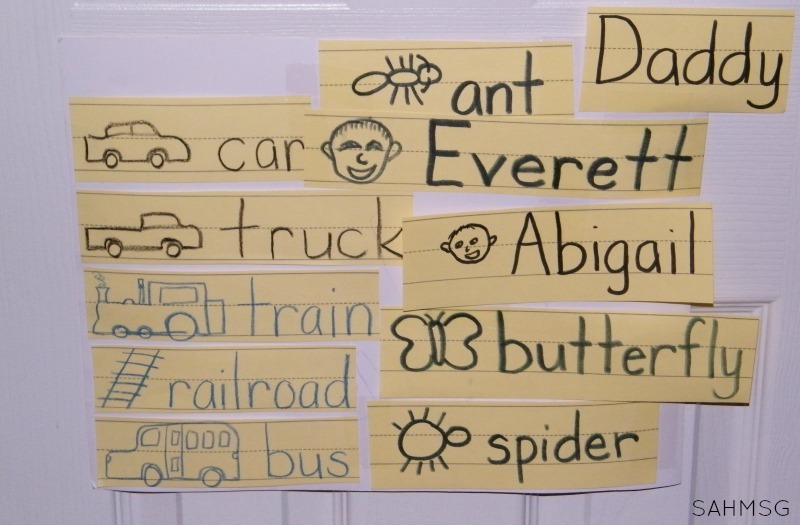 A word wall is a great way to use your child’s interest to encourage the development of their reading skills at home. Every Kindergarten and first grade classroom in America, has a Word Wall. 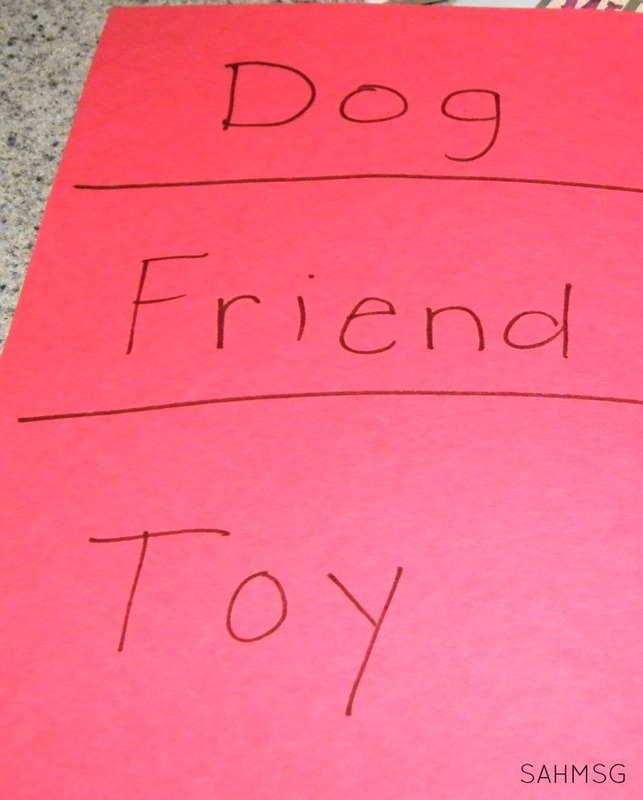 It is generally part of a wall, or a bulletin board that is set aside for posting new words, high frequency words (words that children use or need to write often in the elementary school grades), sight words and words of interest. 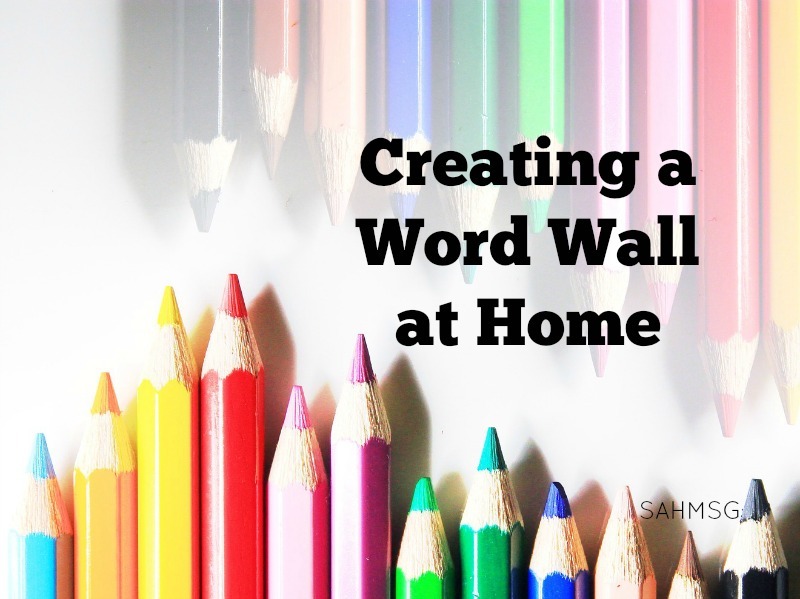 I started creating an at-home Word Wall when my oldest son was a toddler. Children from birth to preschool age, are in the “Emergent Literacy” stage of reading development. They are seeing words, hearing words in conversation, being exposed to books and reading, magazines, catalogs, etc. These young children are learning the importance and necessity of language and reading through everyday interactions and exposure to words around them. You can reinforce your child’s early literacy with this easy word wall activity. At first, I wrote words for the toys that my son played with the most: car, truck, train. I included a picture with the word so that even though he could not read, he could still make an association between the word and the pictured item. I wrote the words on sentence strips, trimmed them and stuck the sentence strips onto a piece of poster board with double stick tape. We taped our word wall on a pantry door in one house. You do not need a large wall or even a huge display. A word wall can even be displayed on the fridge. 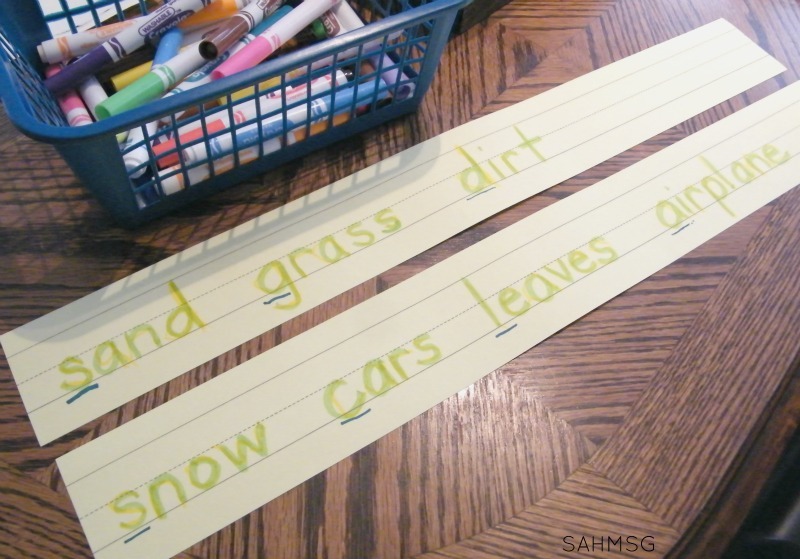 If you do not have sentence strips, using construction paper works great! Write the words on a piece of construction paper then cut the words apart and stick them on the poster board or right on a door or the wall. With my oldest daughter, I posted the word wall on the outside of the bathroom door. While she was potty training, and when I was potty training the twins, we could do a quick review of the word wall words posted close by. Make it fit your needs and the age of your child. When my children are toddlers I need the word wall poster to be higher than they can reach because they try to peel off the words. When they are preschool age, I like the words to be posted at their eye level so they can easily point to words as they say them. When I catch my children pointing to the words at random moments, I quiz them. We don’t write down every word, but we could. On a rainy day inside, write down rain, water, drops, and clouds. If you just played with friends, write down toy, house, happy. If you just played outside, use playground, outside, run, swing, leaf. Color words, shape words, and names of family members are great words to add early on too. Stick them up on the word wall. Pretty simple! To connect reading and writing skills with this word wall, next time you have played outside, take a moment to write down words associated with that event. We played outside and noticed a plane in the sky, dirt and grass. When we went inside, I wrote the words on sentence strips using a highlighter. Then my son traced the words to practice writing. The highlighter trick is a common way to help preschoolers practice writing skills. After they finish, cut apart the words and stick them on the word wall. This word wall activity is a quick, easy, activity when you are waiting for the dryer to finish or dinner is in the oven. You are teaching at home! That is what stay-at-home moms do all day. This simple word wall poster is something that will be used for a long time by your child. You are instilling the love of learning every day. These are some of the supplies we used to make our word wall at home. You do not have to post a lot of words all at once on your word wall for toddlers or even preschoolers. Take it slow and follow your child’s lead. When they ask how to spell a word, use this activity to show them and keep the word posted to reinforce pre-reading skills. Add to the word wall a little at a time and I bet you will see your child pointing to words and reading them before you would even think reading was possible! Want to try more simple learning activities for toddlers and preschoolers? 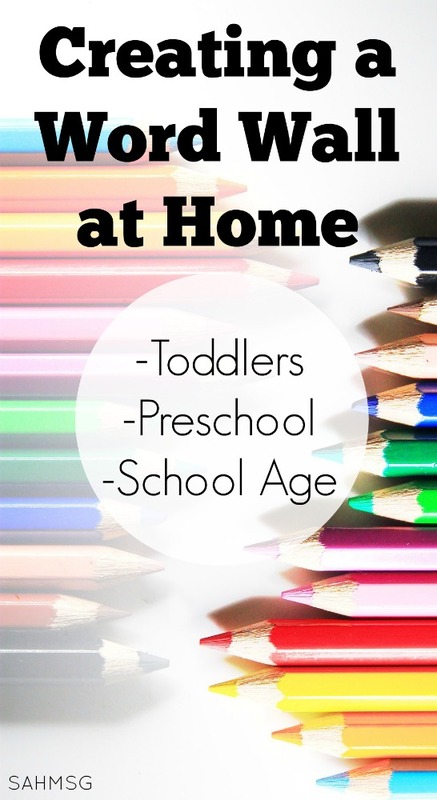 Check out the Toddler Activities and Preschool Activities for simple learning activities that teach. Try these 5 simple writing activities for toddlers if you have young ones. How old was your child when they started pointing to words and reading them? Did their age surprise you? Join with me and other moms over on Twitter Facebook, Google+ or Pinterest. Wow, Very useful and helpful to kids to learn more. Kids are so talented in many ways.